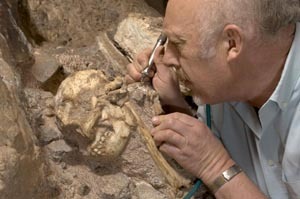 Ancient "Little Foot" Revealed - South Africa's status as a major cradle in the African nursery of humankind has been reinforced with today's unveiling of "Little Foot", the country's oldest, virtually complete fossil human ancestor. Little Foot is the only known virtually complete Australopithecus fossil discovered to date. It is by far the most complete skeleton of a human ancestor older than 1.5 million years ever found. It is also the oldest fossil hominid in southern Africa, dating back 3.67 million years. The unveiling was the first time that the completely cleaned and reconstructed skeleton can be viewed by the national and international media. Discovered by Professor Ron Clarke from the Evolutionary Studies Institute at the University of the Witwatersrand in Johannesburg, South Africa, the fossil was given the nickname of "Little Foot" by Prof. Phillip Tobias, based on Clarke's initial discovery of four small footbones. Its discovery is expected to add a wealth of knowledge about the appearance, full skeletal anatomy, limb lengths and locomotor abilities of one of the species of our early ancestral relatives. "This is one of the most remarkable fossil discoveries made in the history of human origins research and it is a privilege to unveil a finding of this importance today," says Clarke. Reptile Heads Back to the Sea - Using modern research tools on a 155-million-year-old reptile fossil, scientists at Johns Hopkins and the American Museum of Natural History report they have filled in some important clues to the evolution of animals that once roamed land and transitioned to life in the water. A report on the new discoveries about the reptile, Vadasaurus herzogi, suggests that some of the foot-long animal's features, including its elongated, whip-like tail, and triangular-shaped head, are well suited to aquatic life, while its relatively large limbs link it to land-loving species. The well-preserved fossil is housed in the American Museum of Natural History in New York, where the job of unlocking its evolutionary secrets fell to museum research associate Gabriel Bever, Ph.D., who is also assistant professor of functional anatomy and evolution at the Johns Hopkins University School of Medicine, and Mark Norell, Ph.D., the museum's paleontology division chair. According to Bever, their work adds to the list of sea creatures whose ancestors were land-dwelling vertebrates. They include modern-day whales, seals, and sea snakes, and ancient (and now-extinct) species of ichthyosaurs, mosasaur, and plesiosaurs. Bever speculates that Vadasaurus did not use its limbs for propulsion in the water, but to steer. He says Vadasaurus may have swum like a modern sea snake, moving its spinal column with an undulating kind of motion. "Our data indicate that Vadasaurus is an early cousin of the pleurosaur," says Bever. "And these two reptiles are closely related to modern tuatara." The modern tuatara is a lizard-like, land-dwelling reptile that lives on New Zealand's coastal islands and is the single remaining species of rhynchocephalian still left on Earth. Comet is Weird - When comet 45P zipped past Earth early in 2017, researchers observing from NASA's Infrared Telescope Facility, or IRTF, in Hawai'i gave the long-time trekker a thorough astronomical checkup. The results help fill in crucial details about ices in Jupiter-family comets and reveal that quirky 45P doesn't quite match any comet studied so far. Like a doctor recording vital signs, the team measured the levels of nine gases released from the icy nucleus into the comet's thin atmosphere, or coma. Several of these gases supply building blocks for amino acids, sugars and other biologically relevant molecules. Of particular interest were carbon monoxide and methane, which are so hard to detect in Jupiter-family comets that they've only been studied a few times before. The results reveal that 45P is running so low on frozen carbon monoxide, that it is officially considered depleted. By itself, this wouldn't be too surprising, because carbon monoxide escapes into space easily when the Sun warms a comet. But methane is almost as likely to escape, so an object lacking carbon monoxide should have little methane. 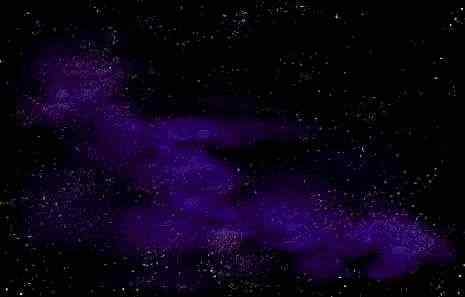 45P, however, is rich in methane and is one of the rare comets that contains more methane than carbon monoxide ice. "Comet scientists are like archaeologists, studying old samples to understand the past," said Boncho Bonev, an astronomer at American University and the second author on the paper. "We want to distinguish comets as they formed from the processing they might have experienced, like separating historical relics from later contamination." Rock Hats Tell New Easter Island Story - Analysis of giant stone hats found on Rapa Nui, Chile (Easter Island) provides evidence contrary to the widely held belief that the ancient civilization had a warrior culture. According to a new study conducted by a team of researchers, these stone hats suggest that the people of Rapa Nui were part of a supportive and inclusive community. Carl Lipo, anthropology professor and director of the Environmental Studies Program at Binghamton University, and a team of researchers studied the monumental statues (moai) on Rapa Nui, and the previously unacknowledged giant stone hats (pukao) that were placed atop them. Using photography to produce 3D computer models, the researchers were able to study the pukao in greater detail and discovered that there are far more drawings carved into the hats than was previously thought. "With the building mitigating any sense of conflict, the moai construction and pukao placement were key parts to the success of the island," said Lipo. "In our analysis of the archaeological records, we see evidence that demonstrates the prehistoric communities repeatedly worked together to build monuments. The action of cooperation had a benefit to the community by enabling sharing of information and resources." While Easter Island is famous, the archaeological record of the island is not well-documented, said Lipo. He believes that scientists can learn a great deal from the pukao by examining this new information. Star is Eating Its Own Planets - A team of U.S. astronomers including UCLA's Benjamin Zuckerman has found evidence suggesting that the strange, unpredictable dimming of a star 550 light-years away may be caused by vast orbiting clouds of gas and dust.The star, RZ Piscium, is in the constellation Pisces, and the huge dust clouds appear to be the remains of one or more destroyed planets. During the erratic dimming episodes, which can last as long as two days, the star becomes as much as one-tenth as bright. A paper detailing the findings is published today in the Astronomical Journal. The star is young -- between 30 million and 50 million years old, the astronomers estimate. But typically, the dust from the star's youth would have dispersed after a few million years, so scientists did not expect that a star that "old" would be surrounded by so much gas and dust. "I've been studying young stars near Earth for 20 years and I've never seen anything like this one," said Zuckerman, a professor of astronomy. "Most sun-like stars have lost their planet-forming disks within a few million years of their birth. The fact that RZ Piscium hosts so much gas and dust after tens of millions of years means it's probably destroying, rather than building, planets." Kristina Punzi, a doctoral student at the Rochester Institute of Technology and the study's lead author, added "Our observations show there are massive blobs of dust and gas that occasionally block the star's light and are probably spiraling into it." VASIMR Engine - I was reading about the VASIMR engine that Franklin Chang Diaz is building and I read it has an ISP of 4000-5000 while a falcon 9 rocket built by SpaceX has an ISP of only 300 and some. My question is what ISP would a plasma ion engine need to lift off from the surface of earth and make it to space. I don't have any ideas on what the weight would be of the ship. Sorry if this is a silly question. It's just in films like the chronicles of Riddick one of the Furyans say they've "located an ion trail that goes offworld." - C. Bell. The ISP (Specific Impulse) of a rocket engine is a measure of the weight of the propellant used to get a certain amount of thrust. It can give you an idea how efficiently the engine uses it's propellant, but it does not take into account the mass of the spacecraft itself which would be a critical concern for lifting off from a high gravity object, like the Earth. The VASIMR can create a very high ISP by sending ions and electrons out its exhaust at somewhere around 50,000 meters/second. To do this it takes a propellant material (perhaps hydrogen, since it the most abundant material in the universe) and uses radio waves to ionize it (heat it till the electrons separate from the nucleus of the hydrogen atoms) then uses a powerful magnetic field to accelerate the ionized propellant out the exhaust to create thrust. The problem is that the electric power needed to heat the propellant and create those magnetic fields can be significant. To send a manned ship to Mars you would probably need a small but powerful nuclear reactor on it. There are several problems with the idea of launching a rocket powered by a nuclear reactor from Earth. The first is that the reactor would likely be so heavy that any the advantage of the VASIMR's high thrust would be negated by the weight of the rocket. There are also serious concerns about the environmental impact of the reactor's nuclear fuel scattering over a wide area should there be an accident during the launch. That doesn't mean that VASIMR, and similar electromagnetic thruster based engine schemes, do not have a future in spaceflight. Carrying a heavy power reactor on your spaceship may not be such a big deal if your ship is leaving from a space station in orbit, rather than launching from Earth. It's not hard to envision a day where passengers and cargo ride up to an orbital platform on conventional rockets, or via a space elevator, then ride to Mars on a VASIMR powered interplanetary shuttle. By leaving from a space station in orbit, the size and weight of the vessel are a much smaller issue. For example, NASA's Deep Space 1 probe used an NSTAR ion engine (another type of electromagnetic thruster) to carry it out to survey the asteroid 9969 Braille back in 1999. This worked because the probe was launched from Earth with a conventional rocket. Once it had gotten away from Earth and shed the booster that go it into orbit, it was very light and was able to power its engine via solar panels on the craft. These type of drives look like they are excellent candidates for space probes moving between planets, but unless a very compact power plant is invented, they may be impractical for launching from the surface of a large celestial body into space. First Public View of the Telegraph -On January 6th, in 1838, Samuel Morse, with his partner, Alfred Vail, gave the first public demonstration of their new invention electric telegraphic system at the Speedwell Iron Works in Morristown, N.J.
Total Lunar Eclipse - On January 31st a total Lunar Eclipse will be visible throughout most of western North America, eastern Asia, Australia, and the Pacific Ocean . A total eclipse occurs when the Moon passes through the Earth's shadow. During the eclipse, the Moon will slowly get darker and then take on a blood red color. Secret UFO Government Investigation Comes to Light - In December the realization that the Air Force had a secret program from 2007 to 2012 studying UFOS came to light. One of the most intriguing incidents studied occurred in 2004 off the cost of California when the Air Force tracked an oblong shaped flying object without wings. Former U.S Navy pilot, Cmdr. David Fravor, whose F/A-18 Hornet fighter jet tracked the object, stated is looked like "A White Tic-Tac, about the same size as a Hornet, 40-feet long with no wings," adding that it was "Just hanging close to the water." Other jets recorded video of the object and Favor was sure it was no optical illusion. "It was a real object, it exists and I saw it," later adding that it was "Something not from the Earth." Despite being studied as a part of the Air Force project, no conclusions were reached about what the pilots saw that day.